Thanks to Matt at Great Food Leicestershire and Rutland for alerting me to this beautiful, atmospheric film about Leicester Market, made by Nick Hamer of Intrepid Media. Filmed from early in the morning during the recent icy weather it really deserves two and a half minutes of your day. While on the subject of the market, the council is taking suggestions of names for the new openair food court area to be created next year. The council has suggested five names but you can come up with your own alternative to either Market Corner, Market Piazza, The Courtyard, Exchange Plaza or Market Courtyard. To vote, via a local newspaper site, click here . Finally, on the subject of food courts, I have heard a rumour there could be plans for the redevelopment of the old International Hotel site on Rutland Street that might involve student accommodation and a public food court with opportunities for entry-level food businesses offering food to residents, local shoppers and businesses. I’ll look out for more details on this as it sounds a promising addition to an area that needs investment. More good news for Leicester’s Cultural Quarter. Shortly to open on Rutland Street is Lanna Thai, not just an upmarket Thai restaurant but a “media performance centre” to boot. The venue is situated in the Leather Factors, that glorious Rennie Mackintosh-style building between Curve and the old Helsinki bar. The upper part of the building was converted into smart, short-let apartments about the time of the construction of Curve and the new restaurant will be over two lower floors, with developers promising that historic features have been maintained and renovated, such as the rear glass curtain wall which will feature a “stunning 5m cascade of white Thai orchids”. The media performance centre is on the lower ground floor, accessed through the restaurant and can be decked out with tables, sofas, a stage or a catwalk for private dinners, exhibitions, performances launches, parties, cinema screenings, comedy, dance – there’s a sprung floor – and so on. Total capacity at the venue will be around 160. This week I’ve been to the Cultural Quarter for a sell-out afternoon film at Phoenix Square, a near sell-out opera at Curve, and am going to a social media seminar at LCB Depot this early evening, followed by dinner at the newly-opened Chutney Ivy. With the Xchange Bar set to open in December, a hotel soon after and now this intriguing new venue, it feels the area might – despite economic gloom – just starting to be coming into its own. Chutney Ivy, the Indian restaurant located in what was once The Quarter near Leicester’s Curve theatre, has made a low-key start this week, offering a lunchtime buffet at an introductory price of £4.95. Following the recommendation of a reader – thanks Ben – I gave it a go and was rather pleased I did. First off, the restaurant has kept the same layout – a single large, airy room, bar area at one end and an open kitchen. The decor has been given a slight overhaul – sort of purple and creams – but it maintains the smart, contemporary feel of its predecessor. The downstairs bar has also been given a makeover and will still be available for those wanting a drink in a smart hideaway. The buffet lunch seems a smart move – they offer just a few dishes, cooked in small batches that can be replenished quickly by the chefs behind the coutner. Starters were a moist, peppery chicken pakora, thinly sliced potato bhaji in a very light batter and well-cooked aubergine bhaji. Poppadums and relishes were there too. Mains included a creamy korma and what our friendly waiter discribed simply as chicken curry and kofta curry. All three were good – distinctive, well-flavoured and nicely spiced. The lamb kofta in particular was excellent. There were also three vegetarian dishes though I only had some of chickpeas, which needed a bit more bite left in them to my taste. Rice and frehly prepared naan breads were good. So, nothing groundbreaking on this evidence but I tasted enough to want to go back to sample the a la carte offering that will be available in the evening. No menu available as yet though they did promise to email one through soon. Staff were pleasant and seemed eager to please. They obviously haven’t quite got all their routines worked out yet – I had to ask for my change to be returned – but that’s why they sensibly seem to have gone for the soft launch. Nice restaurant, think it could do well. 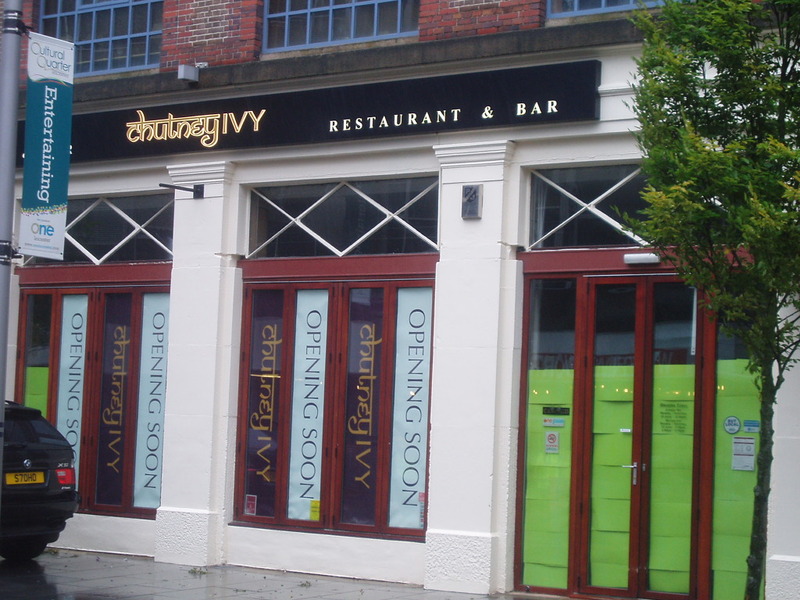 Good to see the premises formerly known as the Quarter are about to re-open as a bar and Indian restaurant called Chutney Ivy. And word on the street is that Cassie from Entropy is opening a bar (“Xchange”) in the Exchange buildings a few doors down – this is the splendid “flat-iron” building opposite the entrance to Curve. It’s important for Leicester that the area thrives and buisnesses like this are needed. If Ramada/Butterfly could just increase the pace and open their 115 -room Encore hotel on Rutland Street we might just start to see the elusive critical mass kick in to the benefit of the beleaguered Phoenix Square and Curve. The stated December 2010 date suggested looks somewhat optimistic to me, from the street anyway. No sign of a website or menu up at Chutney Ivy yet but initial impressions suggest upmarket rather than cheap and cheerful. Sad to see the events this week at The Quarter – one of my favourite city centre venues. Janice and Nigel Gordon were brave to be one of the first bar/restuarant to open up in Leicester’s cultural quarter and I always found them very pleasant hosts and the restuarant had that pleasant knack of somehow being that little bit better than you thought it was going to be. It seems there has been a falling out with the landlord – and I have to be careful here because I’m told there’s been a bit of claim and counter-claim in the courts this week. I understand the landlord is waiting to grant the lease to a new tenant to establish an Indian restaurant but as of last night the situation remains unclear. If that were to happen I hope it would be a really interesting and high quality place rather than an identikit curry house. The Cultural Quarter needs distinctive and attractive venues if is to thrive – the Quarter tries to fulfil that brief and I’d be sad if the Gordons’ drive were to be lost to the area.